​Tegevusluba A2 ja B1 eesti keele taseme eksamiks ettevalmistamisele suunatud täienduskoolituse läbiviimiseks väljastatud Haridus- ja Teadusministeeriumi kantsleri käskkirjaga 14.03.2016 nr 1.1-3/16/47. The adaptation course for newcomers in Estonia has been launched since 2010 by Immisoft’s Education Centre for New Immigrants at WTCT and LaFerme Business Center in Tallinn. Within the framework of the MISA Support Services for New Immigrants our Centre has provided adaptation courses in Russian and English free of charge to third-country nationals until Novembr 2014. The adaptation course was supported by the European Fund for the Integration of Third-Country Nationals and the Ministry of Culture. Since 2012 more than 950 students from 49 different countries have graduated from ImmiSoft's Education Center. Read about the feedback of students by clicking HERE! Currently ImmiSoft provides Estonian language course without any restrictions to all and covers up to 50% of the course fee. The rest of the course fee will be covered by Innove after you have successfully passed the A2, B1 or B2 level exam. The curriculum of the adaptation courses was developed in 2009 by Ülle Rannut and our team members within the framework of the Estonian Integration Strategy 2008–2013, and focuses on the everyday needs of third-country adults in Estonia. The courses include Estonian language studies at A2 and B1 level and a basic course on the Estonian culture and society and on how to use the public and social services available in Estonia. The objective of the welcoming programme is to support the migration process of the newly arrived immigrants by acquainting them with matters related to the functioning of the state and society, organisation of daily life, working, studying and family life, and to promote acquiring basic Estonian language skills at the level of A1. 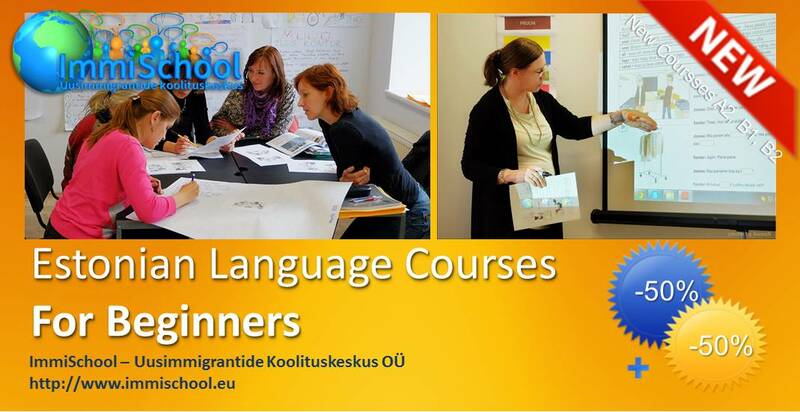 the Estonian language courses for beginners (aiming at the level of A2 (10 ECP, total 260 hours (includes 120 - 180 contact hours, 6 months, twice a week, 6-8 ac hours per week) and B1 (5 ECP, total 130 hours (90 contact hours, 3 months); Every course ends with the national exam at the level of A2, B1 or B2. After graduation you'll receive a certificate. Estonian language studies are supported via the online materials. Basic course - 65 hours of lectures and tours introducing the life, culture and values of Estonian society, and socio-economic integration. The basic course introduces the history, geography, culture, life and society in Estonia, as well as the basic norms and values of Estonian society. Currently some of the lectures and nd excursions are provided in the framework of the Estonian language course 0-A2. Our language training works towards the language examinations in a systematic and targeted manner. The teaching staff utilise contemporary teaching methods, the latest textbooks and modern technology and media. We can address your individual needs and requirements in the very best way through private lessons. This is also achieved in group lessons thanks to the internal differentiation. Ph.D. Ülle Rannut (Director, ImmiSoft Ltd), Elle Sõrmus, MA (Estonian language teacher), Dr.Irina Ronk (Estonian Labour Market Board), Sulev Valdmaa, MA (Jaan Tõnisson Institute, Civic Education Centre), Mart Rannut, Ph.D.
All four areas of competence, listening, speaking, reading and writing, are trained. As language serves above all else for communication purposes, we place special value on the improvement of your speaking skills. Furthermore, we also believe it is important to teach intercultural competence. We help you to expand your repertoire of learning strategies, and promote your active, independent learning. 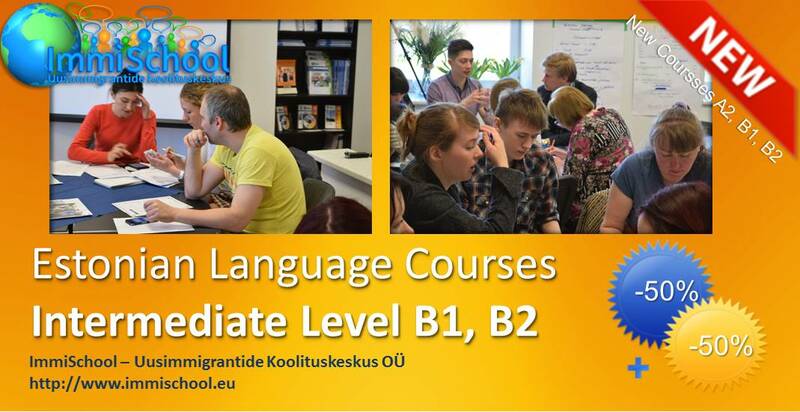 The preparatory course A1 is geared towards students with no prior knowledge of Estonian. 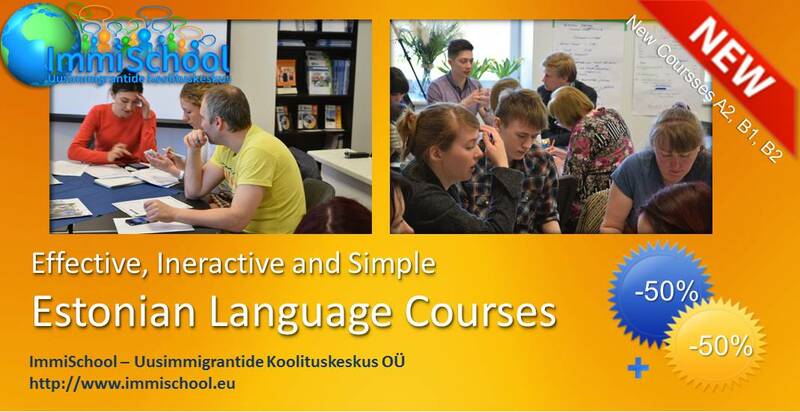 It deals with key topics from day-to-day life, for example, food, leisure and living, and in doing so teaches basic concepts of Estonian grammar.You learn how to greet others and how to present yourself. You are able to ask for something in Estonian and to ask questions. You read simple texts and practise completing forms and writing emails. With the help of listening exercises, you learn to understand spoken Estonian, for example on the radio or on the telephone.The course concludes with the Estonian A1 test. Certificate B2.The preparatory course for the B2 certificate is geared towards students with prior knowledge of Estonian to level B1. Besides topics from day-to-day life, from working life or from the media, more abstract topics such as the future and mobility are also addressed. The grammatical skills already learned are consolidated and expanded upon. You learn to express yourself freely in Estonian, and to argue your point, across a broad range of topics. When it comes to reading, you are introduced to lengthy and complex texts, ranging from poems to popular science texts. In writing, you learn to also produce these texts yourself. With the help of listening exercises, you learn to understand spoken Estonian, not just in everyday situations, but also in the case of more difficult situation. The course concludes with the Estonian B2 examination. Successful participation in the final examination can be used as proof of advanced Estonian language skills, for example when looking for an apprenticeship or job.